100% Guaranteed To Instantly Remove Organic Stains And Odors. Earth Friendly Products Natumate™ Stain & Odor Remover utilizes nature's way of dissolving organic wastes. Enzymes occur naturally, and are responsible for keeping forests and streams clean despite tons of organic wastes from dead trees, plants, animals, insects, and birds. Enzymes digest and liquefy dead organic material the same way enzymes digest the foods we eat. Our Natural Pet Formula also utilizes natural enzymes to eliminate organic stains and odors caused by pets. Use on most everything; fabrics, carpets, upholstery, rugs, and floors. Safe for everyone in your house. 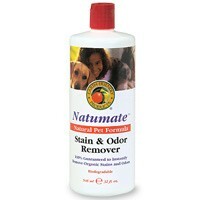 Natumate™ Stain & Odor Remover is gentle- non-toxic, non-flammable and never "sets" stains or fades colors .